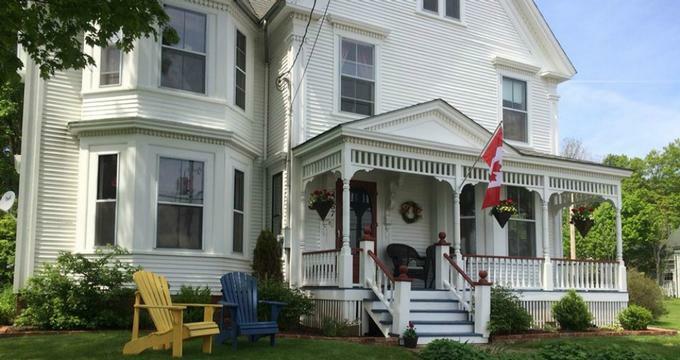 Overlooking the historic town of Annapolis Royal from the quaint village of Granville Ferry, A Seafaring Maiden Bed and Breakfast is an ornate guest house with beautiful views across the Bay of Fundy. Built in 1881 for sea merchant, Captain Joseph Hall, the heritage property was named after one of his daughters who bravely sailed across the Atlantic Ocean in 1870 and has been lovingly preserved in its original state. The charming bed and breakfast retreat features three well-appointed guest rooms with nautically-inspired décor and antique furnishings, plush oriental rugs, and private bathrooms. Modern amenities offer creature comforts and large windows embrace alluring ocean views. Perfectly placed for a relaxing break, A Seafaring Maiden Bed and Breakfast is also ideally located for exploring the area and is just a short drive from many local attractions such as the Fort Anne National Historic Site and Museum. A Seafaring Maiden Bed and Breakfast features three charming guest rooms, each beautifully appointed to behold the breathtaking views across the Bay of Fundy and furnished to reflect the elegance and grace of a bygone era. Named after Captain Joseph Hall's second wife, Abigail Litch, The Abigail is a quiet room with intricate lace window treatments, an inviting queen-size oak bed with handmade quilted bed covers and plush pillows, an early 1900's armoire, and elegant dresser and nightstand. This room has an en-suite bathroom with soaking tub, walk-in shower, luxurious oversized bath towels and signature bathrobes, and organic bath amenities. Named in honor of the Captain’s seafaring daughter after which the Inn is called, The Bessie room features country-style wallpaper and pretty window treatments along with beautiful birch furnishings, including a sumptuous king-size sleigh bed with plush linens and handmade quilts, two lovely bedside night stands, a dresser and an armoire. An en-suite bathroom has a soaking tub, walk-in shower, luxurious oversized bath towels and signature bathrobes, and organic bath amenities. Appropriately named for the builder and original owner of this home, The Captain room boasts a tasteful 'nautical' theme in dark blue and green hues and unobstructed views of the Annapolis River and historic Fort Anne. This welcoming room features an early 1900's solid oak queen-size bed in deluxe linens and handmade quilts, a handsome oak chest and dresser, and a three-piece en-suite bathroom with a soaking tub, walk-in shower, luxurious oversized bath towels and signature bathrobes, and organic bath amenities. A full cooked breakfast is served in the elegant dining room every morning, which still has its original tin ceiling. Guests can tuck into hearty plates of eggs, bacon, sausages, tomatoes, fresh bread, preserves and more, along with fresh fruit, juices, and locally brewed coffee and tea. Guests staying A Seafaring Maiden Bed and Breakfast enjoy a full cooked breakfast in the elegant dining room every morning, along with hot beverages throughout the day. The Inn features several communal areas where guests can relax with a book or socialize with other guests, including a music room with beautifully restored 1920s mahogany cabinet grand piano and a pump organ and a cozy reading corner with an overstuffed easy chair and ottoman, an antique desk and lovely views of the Annapolis River. A Gentlemen's Parlor is home to a majestic mahogany library bookcase filled with books and other reading materials and plush leather furnishings. Granville Ferry offers wonderful attractions and activities to enjoy from visiting the bustling Public Market to buy Okanagan cherries, strawberries straight from Fraser Valley, fresh Coho salmon and live Dungeness crabs to playing a round of golf at the nearby Annapolis Royal Golf and Country Club. The Fort Anne National Historic Site is Canada's oldest site and offers sweeping views of the beautiful Annapolis Basin while highlighting the history of the fort. Other interesting things to see and do include the Raven Haven Beachside Family Park, Delap's Cove Wilderness Trail, Kejimkujik National Park, the North Hills Museum, and the Annapolis Historic Gardens.